Includes seven lithographs and a poster size world map. Premium Hardcover book—a must have for any Fallout® 4 fan! This staggeringly complete guide is stuffed with all the information you'll need to survive and thrive inFallout 4. 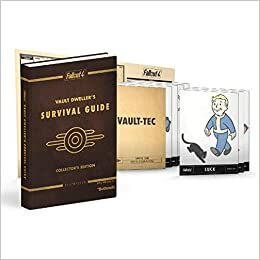 Your ultimate Wasteland companion: walkthroughs and detailed maps give you all the strategies, locations, items, and loot. Specs and reference data for all the perks, armor, weapons, items, and creatures you'll encounter. Complete crafting and workshop references detail the thousands of items you can collect, upgrade, and build. Free Mobile-Friendly eGuide—Unlock the enhanced eGuide for access to updated content, all optimized for a second-screen experience. These limited edition guides will only be printed once. When they are sold out, they will be gone forever!